Well, at least some of the best things are free! Two of my favorite sites in Madrid were the Prado museum and Retiro Park. The art featured at the Prado was fun to learn about and beautiful to admire and Retiro Park was a much-needed break from the bustling streets of Madrid. Before going into detail, I do want to mention that the Prado is not always free, only during certain times. So, plan well and you can save quite a bit of money! We stayed at the Westin Palace in Madrid, which was conveniently located a few minutes from the Prado. This was perfect because the Prado was on the top of our list for places to visit while in Madrid, and since I was under the weather at the end of our trip, traveling too far was not appealing. We made our way over to the entrance around 17:00 on our first day only to find that the cost was an exorbitant 12 euros per person (22 with the official guide!). Willing to pay, we almost continued on. However, we then saw a sign saying that the Prado entrance would be free starting at 18:00! [For more information on pricing and when the museum is free, check the Prices page on the Prado website. The short answer: Monday through Saturday, 18:00-20:00 (closing) and Sundays, 17:00-19:00 (closing)]. The official guides are not available during the free entry hours, but the information desk has brochures in several languages that map out the popular paintings throughout the museum. In addition, the Prado website has information about 15 masterpieces found at the museum. We used our Rick Steves’ Spain guidebook to help us focus on particular paintings and learn additional information about each one, but we did find that most paintings had some sort of description in Spanish and English. Since the line didn’t take long to get through and the crowds were manageable during the free time, the only real downside is that the time is limited to the last two hours that the museum is open each day. We were able to see plenty in those two hours, but there is so much to see in the Prado, so for many, a full (or at least longer) day might be more practical than waiting for the free time to start. 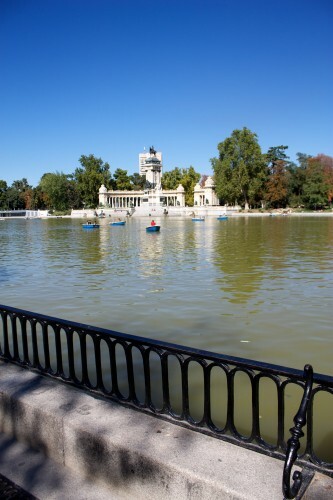 Close to the Prado, Retiro Park (Parque del Buen Retiro) sits on over 300 acres of land…in the middle of Madrid! 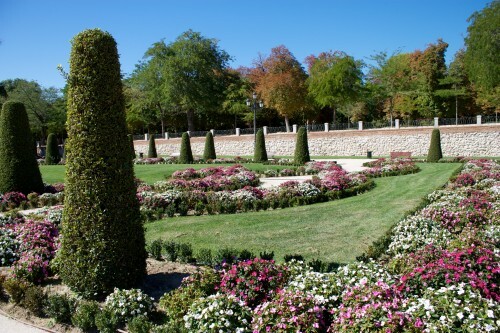 It’s hard to believe that the beautiful and peaceful gardens are located in the middle of such a lively city. Throughout the park there are trees to provide shade and, in several instances, we noticed people laying around, either sleeping or reading a book. If relaxing in the park fits your agenda, think about bringing a towel or blanket to really enjoy the park like a local. Retiro Park was nice and relaxing, but also lively with tourists and locals alike – especially around the lake. We visited on a Saturday afternoon, so the area around the lake was packed with families and couples. We sat on the ledge by the lake (seen in the picture to the right) and watched as people purchased food and souvenirs or just hurried by, chatting away. We enjoyed watching the people having fun on the lake, rowing in the rented boats. I was considering renting one, but it was very hot out (around 90° or so) and the lake was completely unprotected from the blazing sun. So, we sat instead, shaded by the trees surrounding the lake and enjoyed our time people-watching. With so many expensive attractions in large cities, it’s always nice when there is a little something for free. In addition to the free hours at the Prado and the always-free Retiro Park, the Reina Sofía (a great modern art museum in Madrid) offers free hours and Plaza Mayor, always bustling, is free (and not too expensive for a sit-down meal and drink). However your time is spent in Madrid, do not forget to enjoy some of the greatest sites the city has to offer – for free! This entry was posted in Travel and tagged Madrid, Portugal/Spain 2012 Trip, Prado, Retiro Park, Spain by Kristin. Bookmark the permalink.